You must make reservations at least 5 minutes in advance of the time at Barb & Ernie's Old Country Inn. Parking along the front of the restaurant, in the adjacent parking lot just north of the restaurant and along 72 Avenue where not marked off by "no parking" signs. One public transit stop going southbound on 99 street about a quarter block south of the restaurant and one public transit stop going northbound on 99 street about one block south of the restaurant. We offer homestyle cooking with a German attitude. This forty year old family-owned and operated restaurant is located just off historic Whyte Avenue and is about as close as it gets to home-style, rib-sticking, comfort food that you will get. Whether you want a big breakfast to get you through the day, or, if you fancy some old fashioned German style food in the evening or at lunch - we have both. Our signature dishes include homemade white-wine hollandaise on our eggs Benedict, our German style bratwurst and pork schnitzel, and our gigantic eye-popping hotcakes. We are also open Friday and Saturday nights for our German style buffet which changes each week and lets you try a little bit of everything. Great service - super friendly staff! Loved the buffet, great value for the price - includes soup, salad bar, great entree selection and dessert bar. Took my husband out for birthday dinner - had the buffet on a very slow night (major snowstorm) so the food wasn't as good as it could have been but there was lots of it and a good variety. Managed to spend time having a nice chat with the owner (I think) who was very friendly and nice. We had the supper buffet on a Saturday. They were very busy and had some large tables so it was quite loud and the place isn't very big. The buffet was quite good if you like German food or a change from the usual and great value for your money!! I really enjoyed most of the food and the desserts were awesome!!! I would go again, maybe not right away but down the road a bit. The staff were amazing at accommodating our large group. I was hesitant to book a group of 19 for dinner, but they were definitely prepared to host us, and went above and beyond to keep us happy. Drinks filled, menu questions answered, dessert recommendations, you name it. Can't wait to go back. We booked for a group pre-Christmas brunch, and as always, it was a good solid choice. Prices are reasonable, good solid homestyle food, killer schnitzel, served in abundance. The place is always full, and we still didn't feel rushed, staff is friendly amd great service. Only downside was our table was directly in line with entrance door, amd got pretty chilly at the end of table closest to the door with people going in and out. We had a great time and was absolutely fantastic to find a place open to reservations even though they are always busy. No issues ever recommending this restaurant for good, abundant homstyle german food, and menu has lots of choices. Outstanding service and food was great! Had a party of 18 for a Christmas breakfast. Had our own room, decorated table with Christmas napkins. Chris our server was excellent, ensured we had everything we needed and some! We will be back for sure! Nice family get together to celebrate a birthday. Long time since we had been and it hasn’t changed a bit. FANTASTIC!!!! The starter soup was yummy. Although there wasn't a huge selection in the buffet, it was delicious and totally satisfying! The corn pudding was oh so yummy!!! It was my choice for dessert . The salad bar and dessert bar were great too, root beer cheesecake that really tasted like root beer! We all left quite happy! We arrived late in the evening for the buffet. The only reason it didn't get five stars was the snitzel was tough. Borsch soup was great. Lots of choices for dessert. The rest of the main course choices were all good- I tried them all. I am so glad we made reservations as this place was hoppin' on a Sunday morning and we were a party of 9. Unusual breakfast choices with a distinctly German flair. The kids loved the pancakes, Bratwurst sausage and the eggs Bennie combos. The schnitzel was a bit too thick for my mother but she likes it done with veal and pounded till it was nearly see-through before frying. (and served with lemon). Overall though, good service, cozy atmosphere and great portion sizes. We will be back! Half of our group chose the buffet and the other half ordered from the menu. All of us were very pleased with our choices. The variety of dessert items with the buffet were unbelievable! Thanks for the great dinner out. Barb and Ernie’s is a neighbourhood gem. 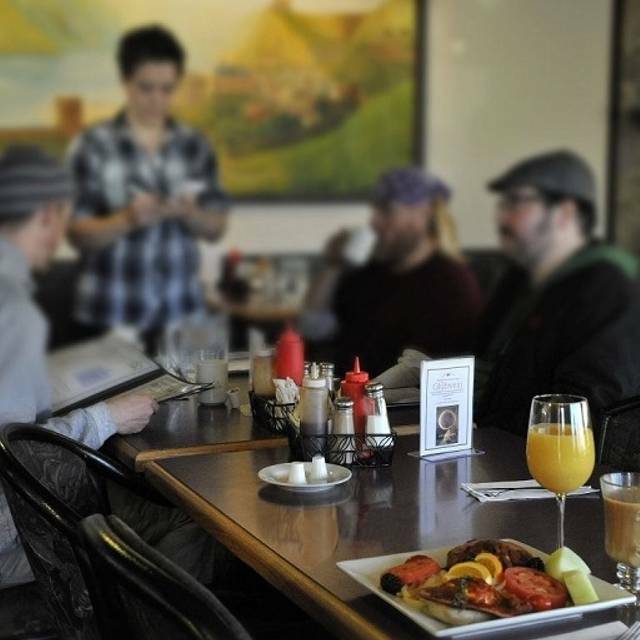 Fantastic breakfast has always been a draw for us on the weekends. This time, we decided to try the Friday night German buffet. It was fantastic and well worth the price. Thanks for another memorable meal. We will be back for a weekend breakfast sometime soon. I love this little place. It's always been charming and welcoming. The staff here are great and were very friendly. I have to say I was a little disappointed in the quality of the food. I used to go to Barb and Ernie's often for spazle and couldn't get enough if it.. maybe it's the buffet style of service I opted for but the food wasn't on par as it used to be. Went for Sat buffet. WOW, so good. Started with Borscht, which was great . The buffet was topped by the cherry gravy for the schnitzel, delicious. Dessert was an effort because the meal was so filling. We were glad we made the effort. Kahlua pears and root beer cheesecake both were absolutely fantastic. Thomas, Char and Chris really hit it out of the park. Would totally recommend this buffet. Presentation sloppy and wine glasses were dirty. Asked for a new one and waited then had to ask again. Pleasant people but very busy with only 2servers. Went for the Sunday smorgasbord and really enjoyed the meal. The service was great and very friendly. Will definitely go back for the home cooked food. Wonderful home cooked food served with excellent service. We went there for Mother's Day and enjoyed the evening Buffet. All of the items on the buffet were outstanding and true to Great German home cooking. The value for the dollar was outstanding. We will be back for dinner. Great food as usual!! Amazing selection of desserts. Will say that the place is looking pretty shabby. It might be time for some renovations. Went for the Mother's Day buffet and it was fabulous. Food was delicious, desert was amazing. Highly recommend this place if you want something different from the usual chain restaurants. Due to early closing time we were rushed to order our dinner. Hot food items were lukewarm, could have been warmer. Neat place, very accommodating. Recommended. Great authentic German food. Nice change from the usual stuff in the city. The food and service was awesome! Fantastic find. Love the buffet, will have to come back and try the breakfast. Yummy! Desserts were also plentiful and just the right size after a buffet! Fantastic service and great tasting food. This restaurant has been a favorite for years and never disappoints. Was very tasty and the buffet had choices for everyone. Amazing service and great food! The dessert was homemade and absolutely fantastic! We will definitely be back. Wishing you great success in 2018. Food was great with many excellent choices, kids loved the pancakes!! Nice relaxed atmosphere, staff were attentive and always at hand. The food and service were fantastic!! A true German experience. We loved it!! It was our first visit. I thought it was excellent. The food was great. It was a buffet and everything was hot and ready. Our waitress was very nice. She suggested certain things from the buffet as I had asked for a menu. She said most of it is already there. It was just a wonderful time. We had a group of 14 come together for brunch. Many restaurants treat large groups as a "pain" but the service and treatment at Barb & Ernie's was wonderful. From the moment each guest arrived, they were offered coffee (or a beverage of choice) and their cups remained filled up througout the meal. All of our orders arrived at the same time and everything was accurate, delicious and the servings were HUGE! We felt very welcome and were treated very kindly there, and the food was terrific. We plan to hold another family brunch there in the near future! We went to Barb and Ernie’s for our anniversary dinner with our family. The buffet was excellent. There was a fantastic variety of delicious food to appeal to evryone’s palette. After hearing multiple comments about this restaurant, it was time to try. Went on a Friday night and was pleasantly surprised. While the decor is dated, the food is simple and well prepared. If you're looking for a high end experience, go somewhere else. What you get here is very home style European(German) fare, and lots of it. Buffet on Friday and Saturday nights which allow you to try multiple Entree types. Snitzel is great, with multiple toppings available. Simple tasty food, decently priced. The thanksgiving buffet was wonderful. The service was great as well!! We will definitely be back!!! We had the smorgasbord and it provided an excellent variety of dishes. They were tasty and included many authentic German favorites I remember from my childhood.